Sarova Shaba Game Lodge is located in a natural oasis in the heart of the Shaba Game Reserve or "Born Free Country" that Joy and George Adamson called home for many years. The lodge is 314 km from Nairobi, a 45 minute flight from Nairobi to Shaba or Samburu airstrip or a picturesque 5 hour drive through the curving roads around Mt. Kenya crossing the equator at Nanyuki. 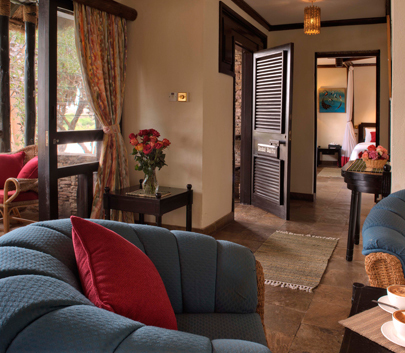 This Luxurious Game Lodge is set in the Kenyan semi-arid north, offers 85 modern rooms in chalet style with a private views of the wildlife-rich banks of the Ewaso Nyiro River. Each room overlooks the river where the elephants sometimes make an appearance or the crocodiles come out to lounge by the river’s banks. All chalet style rooms and suites at the Lodge have: private balconies with close views of the river and game park, ensuite bathrooms with permanent showers and WC, running hot and cold water, razor outlets with 220 and 240 volts, beds with mosquito nets and duvets, overhead fans, tea and coffee making facilities. The Lodge excels in the freshness and quality of its food which is supported by the lodge’s own vegetable and herb garden. The food quality and standards embody those of the renowned Sarova cuisine brand “Kitchens of Sarova”. 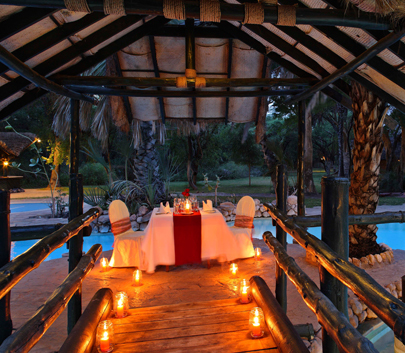 All meals are served “al fresco” at the Surpelei Restaurant that is raised on stilts offering breathtaking views of the lush gardens and the Ewaso Nyiro River. The restaurant is fitted with elaborate buffet counters unmatched in all lodges and live cooking stations all set to tempt and please your palate. Sarova Shaba’s chefs are readily available to cater for most special dietary requirements and meal preferences. 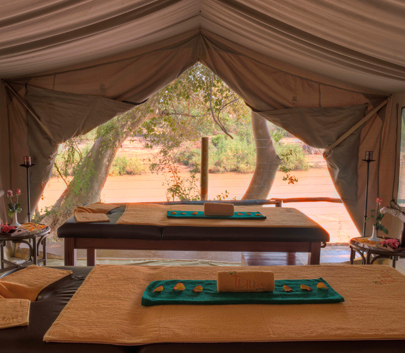 Relax and unwind as you enjoy a great massage at the Tulia mini spa while listening to the trickling natural streams and the wild sounds of the African jungle. “Tulia” is a Swahili word meaning relaxation. Alternatively, get adventurous and have the massage in the wild. Swedish - Holistic - Aromatherapy - Indian, among others! Are you interested in booking at the Sarova Shaba Game Lodge? Click here for the best rates.